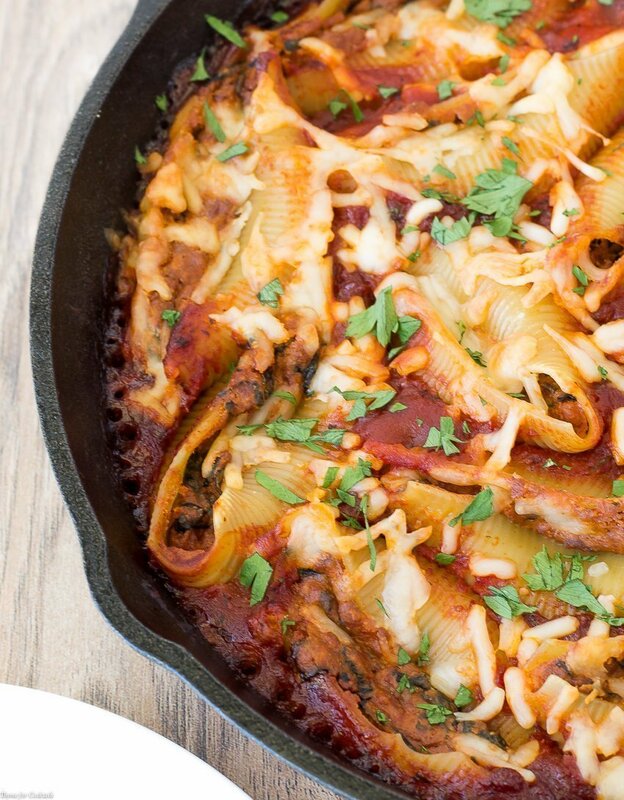 These delicious 6-ingredient Spinach And Chorizo Stuffed Shells are an easy homestyle meal your family will love. 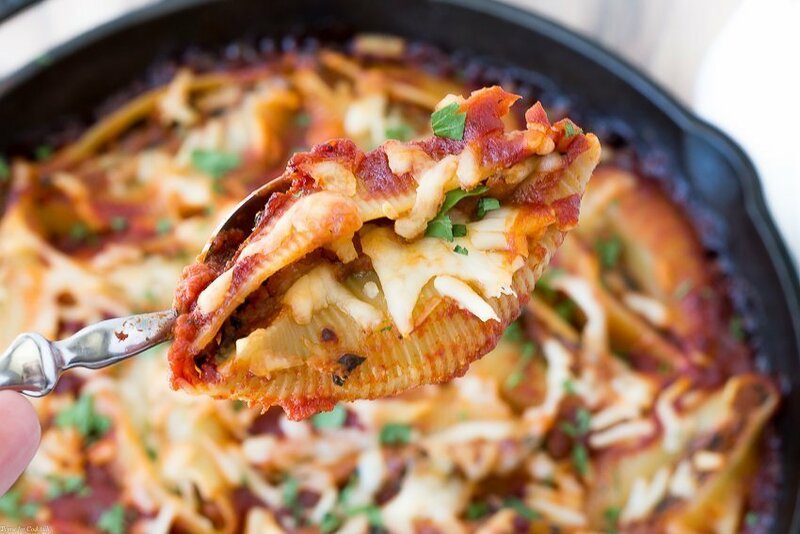 Tender pasta shells stuffed with spicy chorizo, fresh spinach and ricotta cheese then simmered in a rich, hearty sauce and topped with melty mozzarella cheese. Hey folks! How was your holiday weekend? Are you still super full of yummy Labor Day recipes like we are? I am pretty sure we did nothing but eat, sleep and binge-watch for 3 days straight! It was a much need downtime. 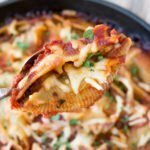 [bctt tweet=”Spinach And Chorizo Stuffed Shells #simmeredintradition #5ingredient #pasta” username=”thyme4cocktails”] But now it’s time to get back to the grind, which means blogging about great recipes like these Spinach And Chorizo Stuffed Shells. The kid might be off on his own adventure, but that doesn’t mean Paul and I aren’t still dipping into my arsenal of easy weeknight meals. Between extra jobs, therapy appointments and spending time with friends I am pretty sure we haven’t been home much the last 2 weeks. Not to mention the fact that we are in bed by 8pm most nights anymore. Staying up late isn’t usually feasible when your husband gets up at 330am for work! 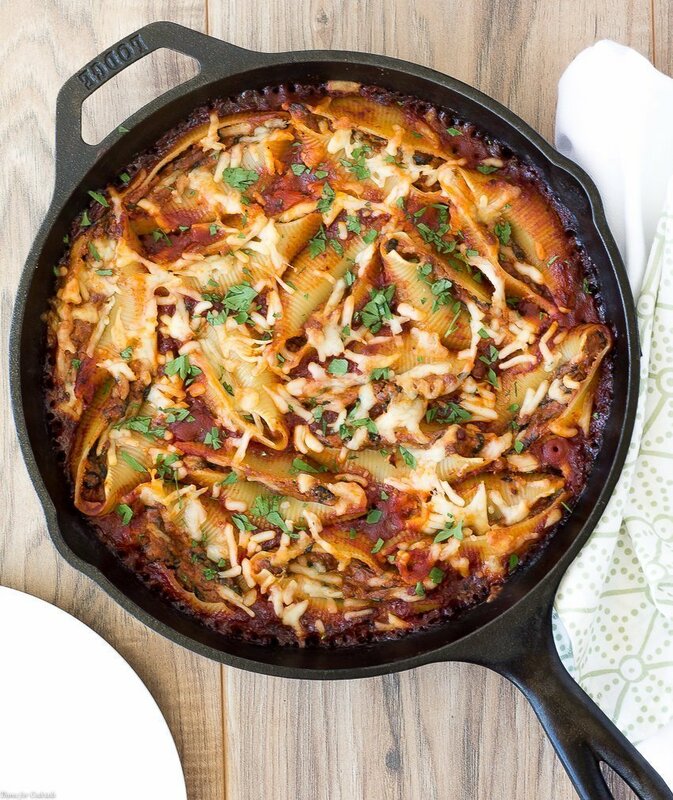 So a delicious skillet full of Spinach And Chorizo Stuffed Shells is just what we need on those nights. I love that it is a fusion of our 2 favorite cuisines, Mexican and Italian. Chorizo is such a great ingredient to work with. It adds soooo much flavor to dishes without having to worry about adding a ton of spices. 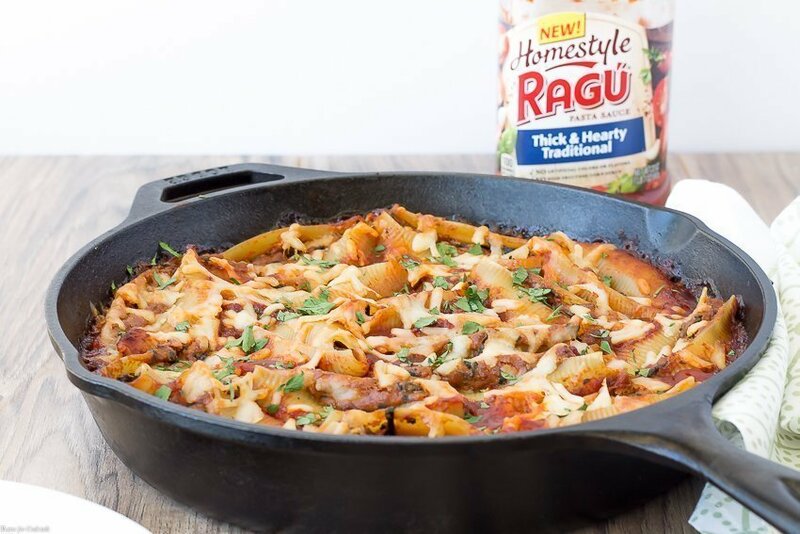 The same holds true for our favorite RAGÚ® Homestyle sauces. I don’t take short cuts when I make homemade sauce, and neither do they. Their sauces are full of bold flavors layered together without artificial flavors, artificial colors or high fructose corn syrup. It was just the sauce for the Homestyle Zucchini Gnocchi I made last month! These delicious 6-ingredient Spinach And Chorizo Stuffed Shells are an easy homestyle meal your family with love. 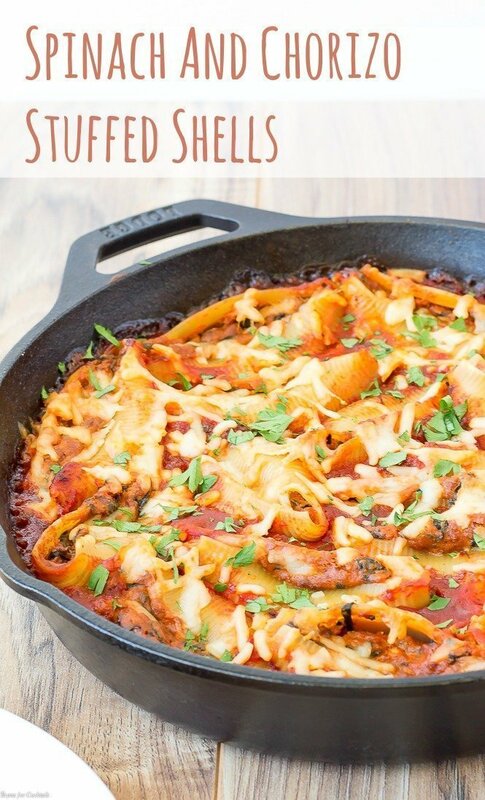 Tender pasta shells stuffed with spicy chorizo, fresh spinach and ricotta cheese then simmered in a rich, hearty sauce. While pasta cooks heat a medium skillet over medium high heat. Add chorizo, cook 4-5 minutes. Add spinach, cook 2-3 minutes stirring occasionally. Remove skillet from heat and set aside to cool completely. 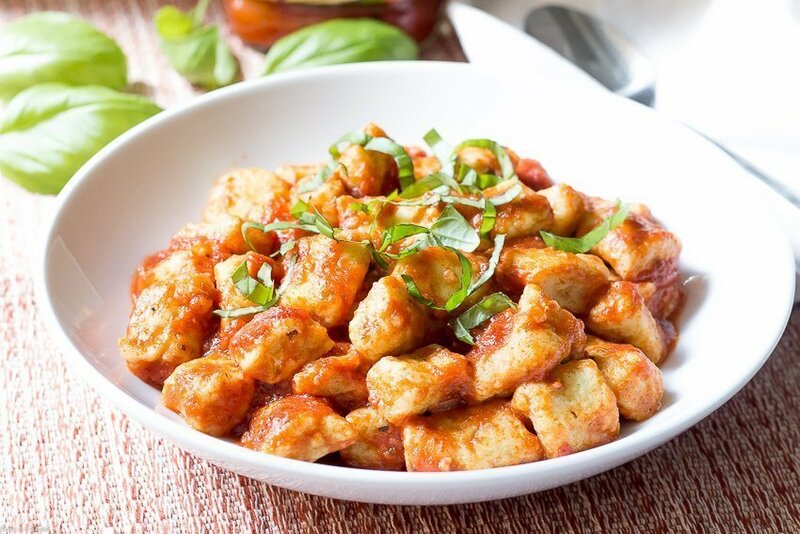 Stir ricotta into chorizo mixture. Pour sauce into a large cast iron skillet or baking dish. Evenly fill shells with ricotta mixture. Place filled shells in sauce, opening side up. Sprinkle with mozzarella cheese. Bake 25-30 minutes.